Typically, mainstream films about revolution have a fairly fine line to walk. Obviously, some revolutions - namely, the American Revolution - are good, but advocating for violent revolution from an otherwise seemingly stable society is, aside from that one instance, never portrayed as the right decision. Sure, you can revolt against an actual dictator, often in the form of an alien invasion or a far-future dystopia, but against a functioning society that is typically viewed as flawed but not actively monstrous? Nonviolence isn't just the first response, it's the only moral response. 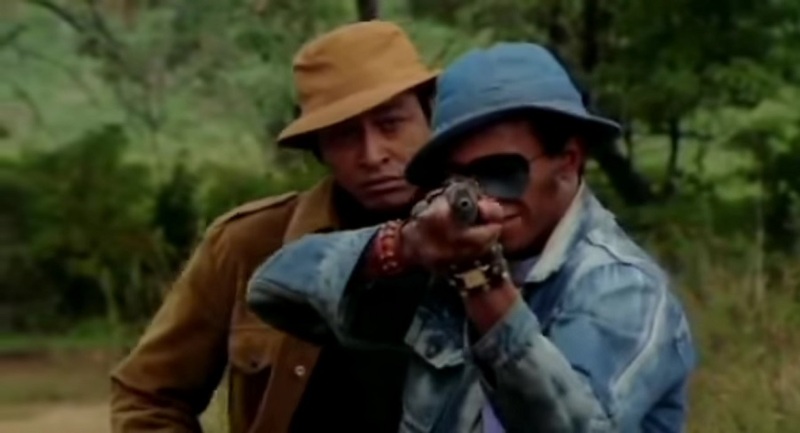 In 1973, Hogan's Heroes actor Ivan Dixon directed his second of two feature films: The Spook Who Sat By The Door. Adapting a 1969 novel by Sam Greenlee, the movie follows Dan Freeman, a brilliant young black man who gets an opportunity to join the CIA when they're forced to integrate. After graduating from a program that tries desperately to fail him out as one of the best students the CIA had ever seen, he is made Top Secret Reproductions Manager Section Chief -- basically, he watches over the Xerox machine. He puts in years at the CIA, and when the time is right, he finally leaves to take a position as a social worker in his hometown, Chicago. Unbeknownst to his former handlers, however, Dan is a revolutionary in the guise of a bookworm, and when he arrives in Chicago, he quickly begins recruiting gang members and training them in counterintelligence and guerilla warfare. The goal? The violent overthrow of white supremacy. Remarkably, this isn't a point of anguish, for Dan or for any character in the film. At no point does the film step back to reproach Dan's anger, or suggest that some white people are good, therefore white society deserves to survive. Nor does the film suggest that white people are irredeemably evil. Instead, The Spook Who Sat By The Door puts forth an idea that filmgoers, both today and at the time the movie was made, might find fairly radical: A good person defending a corrupt system out of a need for stability is just as much a problem as the people actively abusing that system. One of the most shocking things about the movie is that at no point are the white people here as cartoonishly indifferent to life and morality as, say, the Capitol in The Hunger Games or the front of the train in Snowpiercer, two of the other only major modern films to advocate the violent overthrow of a society. While the white people here do purposely try and hold black people down, most of it is through everyday microaggressions, the myriad minor indignities that help them subtly reinforce their own supremacy in day-to-day life. There are people in the film, both black and white, who are pretty good people, who are close friends with our lead... but when the chips are down, they want to stay comfortable rather than be equal, and, as Dan says, "This is not about hating white folks. This is about loving freedom enough to fight and die for it." The Spook Who Sat By The Door is almost frighteningly relevant today. The film's real Revolution kicks off, after all, after the police shoot an unarmed young black boy from behind, killing him. As protests threaten to turn into riots, the police respond by firing into a crowd and bringing attack dogs. Police begin arresting anyone who looks 'suspicious' - read: black men - and then they call in the National Guard, all while the media writes puff pieces about the police helping grandmothers cross the street rather than reporting on the abuse. You could remake this movie in a post-Ferguson America and ultimately change very little. Indeed, the film The Spook Who Sat By The Door most resembles is Gillo Pontecorvo's timeless 1966 masterpiece, The Battle of Algiers, a blisteringly realistic docu-drama about Algerians taking up urban guerilla warfare to free their nation from French rule. Algiers unquestionably has more resources and experience behind it, but the core conceit, the in-depth look at urban revolution of a people fighting to be free, remains. And Dixon's film is driven by the kind of rage that can't be faked -- and offers up some of the most jaw-dropping scenes of riots and urban American violence I've ever seen on film. There's an added urgency for American audiences to see it happening on American streets, the aftermath of American sins. Dixon more than made the most of the budget he had access to. "We have to maintain law and order or we might as well be back in the jungle." "The ghetto is a jungle, always has been. You can not cage people like animals and not expect them to fight back someday. It's always been an army occupation here, with police badges and uniforms. You and me, a cop and a social worker, we're the keepers of this goddamn zoo." "Streets have to be safe." "Safe for who? You're here to protect property, not lives." While the budget for the film doesn't appear to be very high, a great, insightful script and a couple good performances are affordable fixes that help make The Spook Who Sat By The Door stand out. While the film doesn't necessarily offer any actual solutions, it's a powerful release valve for racial tensions, a smartly-made plea to understand the frustration felt by so many of our citizens. As a fantasy, it is bleak beyond imagining, but Ivan Dixon never undersells, betrays, or judges the righteous rage behind it all. White audiences at the time were worried that it would incite black audiences to riot - a familiar refrain repeated in 1989 for Spike Lee's masterpiece, Do The Right Thing, and again in 2015 with Straight Outta Compton - and had the film pulled from theaters, but (in addition to being almost staggeringly condescending) that misses the element of fantasy, rather than advocacy, behind any revenge narrative. The phrase 'the spook who sat by the door' refers to a practice made by companies in the early days on integration, in which they would hire a single black person and station them near the entrance, so people could see how 'diverse' they were without actually giving up any power or giving the person any actual responsibility. Here, though, Ivan Dixon subverts that idea. The spook in question refers also to the term's other, less derogatory meaning: A spy. He sits quietly at the door of the institutions of American power, learning everything they have to offer. And when things start to go wrong for them, they never once realize that they created the instrument of their own downfall. The Spook Who Sat By The Door was initially released in 1973, and after decades as a 'lost' film was finally released on DVD in 2004. In 2012, the Library of Congress added it to the National Film Registry to be preserved for future generations as a vital piece of American cultural history. It is currently available to watch on YouTube, though I have no idea if it is a legal stream.